So, I’m surfing the internet the other day, looking for how to make finger paints that are safe for my baby and toddler to play with and EVERYTHING has milk. I had to improvise. Then, I decided that, not only did I need to improvise, I should probably share, too, because there’s a lot of fun to be had with finger paints. Especially edible ones. 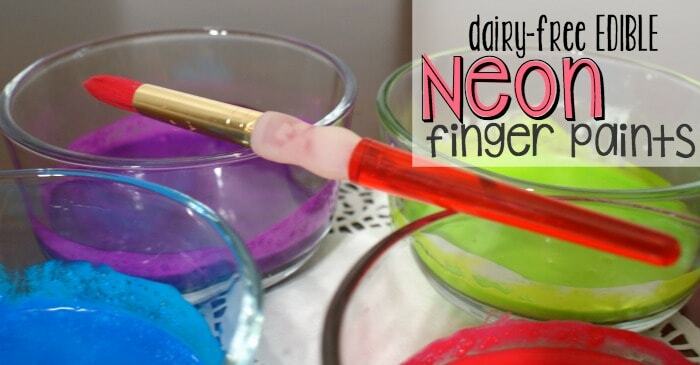 So, I made these awesome Dairy-Free Edible Neon Finger Paints. And guess what? The first thing BOTH Jelly and Donut did–put some in their mouths. 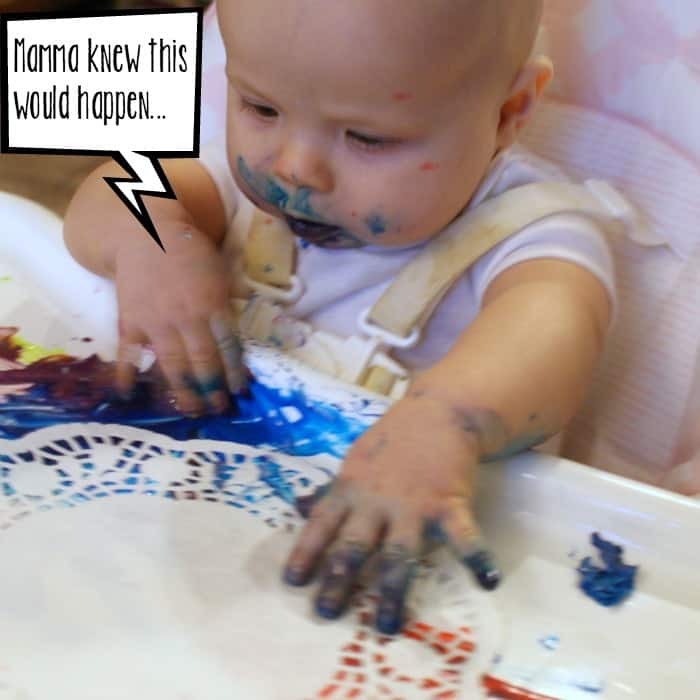 So, I’m really, really glad we didn’t do regular finger paints, or finger paints with milk. Both would have had negative outcomes. Heh. Outcomes. LOL! So, this is really simple. If you mess this up, you’re grounded from the kitchen. Pour about a 1/3 cup of coconut milk into a bowl. 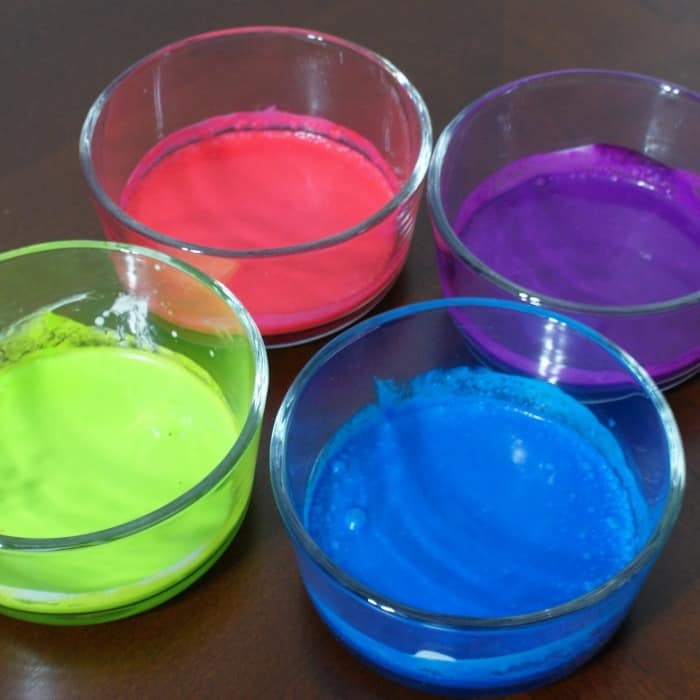 Add 10-12 drops of one color of food coloring and stir until mixed thoroughly. Repeat for all colors you want. If you love this recipe, pin it, please? That way other people can see the awesomeness that is the Dairy-Free Edible Neon Finger Paints. We could all use a little of that in our lives. 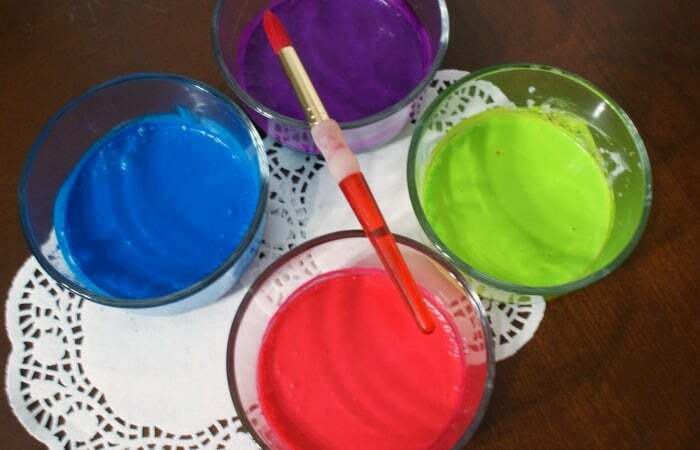 What we did with our finger paints? We totally made little doily-gifts to send to our family members this holiday. I know, we’re kind of starting early, but I haven’t sent anything in a couple of years (it’s been kind of busy around here and I’m sorry, family, I’m a bad person). So, I wanted to be on the ball this year and get something out before it was too late. Here’s a cute little pic of what we did. By the way, this was such an easy recipe, I totally threw-out the leftovers (totally not like me) and plan to make more on a regular basis, so you might get to see some cute crafts made out of this paint in the future. Yippe!